A 2D survey is a collection of related 2D lines. Each line is defined by a set of tie points that link common midpoint (CMP) locations to eastings and northings (X/Y). Surveys are found in the Survey tab of the Control Panel. Select a 2D survey to show its details in the panel below. Line colour: The display colour for lines in views. Line count: The number of lines in the survey. Search box: Type text to show matching lines. Single line: Click the line. Consecutive lines: Click the first line, press Shift and left-click the last line. Any lines: Press Ctrl button and left-click each line. The extents information shows the start and end coordinates, the CMP range, and the length. The extents information shows the total number of lines, the total CMP count and the total line length. Deselect All: Clear the line selection. 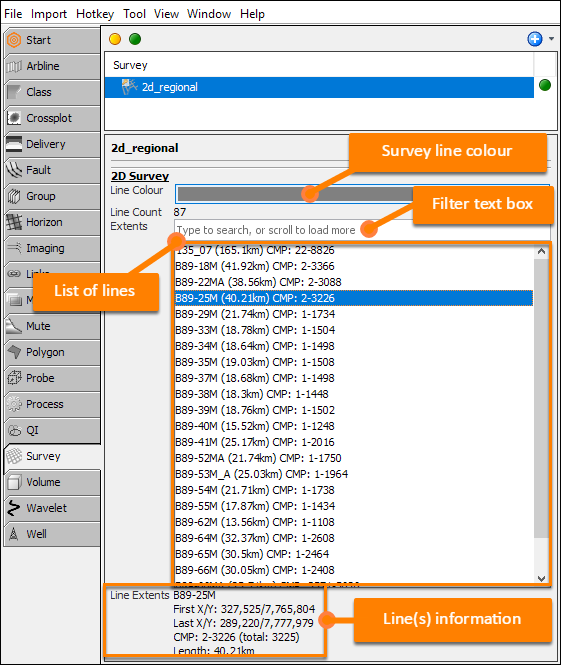 Delete line(s) from 'survey_name': Remove selected line(s) from the survey. 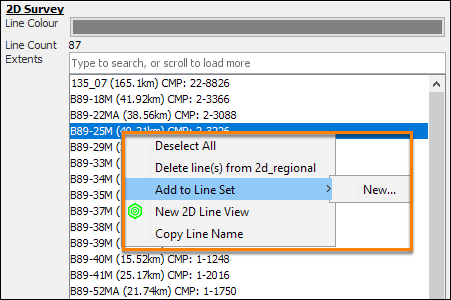 Add to Line Set: Add selected line(s) to a new or existing line set (see Managing 2D line set). New 2D Line View: Show line(s) in a new 2D Line View (see Viewing Lines in 2D Line Views). Copy Line Name: Copy names of the line(s) to clipboard.